In my time as a holistic vet, I have gone from treating animals who are dying of cancer to treating animals who are living with cancer. Because these animals are living! They are enjoying life and waking up each day without any attachment to having cancer. They don’t know that they have cancer and because of that they can truly live. I have often found that if we can catch the cancer early these wonderful beings can have longer lives then we ever imagined. On average I have found with using integrative and holistic treatments, we can double their prognosis time. In many we can more than double it. That’s not bad considering most of the dogs and cats I work with are over the age of 10 years. So how do you decide what to do for your animal friend? Do you do surgery? Find a holistic vet? Look into chemotherapy? Or do you just take extra time and love them and let them be? You want your friend to get better. Best of all would be if you could make the cancer go away completely but you also don’t want him/her to suffer. Quality of life is very important and the last thing you want is for the last few months of their life to be full of pain and misery. Find a holistic vet and a western vet that you trust. Come to a balance of traditional and holistic. I have found that the animals who do best are getting treatment and advice from their western vet and their holistic vet. Consider seeing an oncologist (cancer specialist) to learn about all your options, even if you are against doing chemotherapy. Sometimes that means surgery and acupuncture. Sometimes it is herbal therapies with prednisone. Sometimes it is chemo with acupuncture and herbs to help with side effects and keeping appetite and immunity up. This is not a place to either/or. Use everything that is available. You don’t have to choose between the two. That being said it is very important if you are combining treatments to find a western vet who is open to you working with a holistic vet and a holistic vet who is open to western treatments. In some cases they are the same person who practices both modalities. However many of us who have taken the holistic route don’t practice much western medicine. I prefer my clients to work with a western vet who is up on all the latest cancer research. I am lucky to have a wonderful western vet who has a special interest in cancer treatment working very close to my clinic. Dr. Tim Kraabel, of Lien Animal Clinic, is an amazing veterinarian and while he is definitely a western vet he is extremely supportive and open to the treatment options I offer. We have worked together on many cancer cases and I feel like when my animal clients have Tim on board, we can get amazing results. He does chemotherapy with with an emphasis on quality of life. He is very honest about the prognosis of various cancer treatments and very supportive of not just the animals but also the humans involved in the journey of living with cancer. How do you find a good vet? Word of mouth is the best place to start. Ask around if you don’t already have someone you trust. Many times pet food stores will have recommendations. Ask your dog’s groomer or a local dog walker. Post a question on a community blog. IVAS has a list of vets certified in acupuncture and herbal medicine but there are many holistic vets not listed on their site who are good (I’m not listed). Also see my article How to Find a Good Holistic Vet to Work With. Acupuncture is great for animals living with cancer. 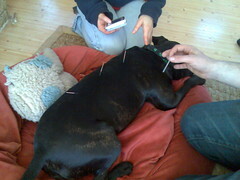 If you have the money to do it, I think every animal with cancer should get acupuncture. I treat most animals I work with every one to three weeks. I once went to a talk given by a veterinary oncologist from a major university. Even though he was a western vet, he mentioned that he always recommended acupuncture along with his chemotherapy and radiation. He said that those animals just did better. I have found the same to be true. Not only can it help to slow down tumor growth but it improves quality of life through increased energy and appetite and less pain. I have had some animals who I have treated with acupuncture alone who did much better than any prognosis, sometimes by a year or more. 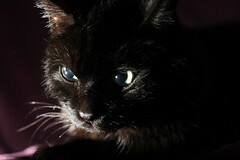 In cats, who often do not do well on multiple medications, acupuncture is a very good option. Most cats and dogs like acupuncture because it makes them feel a lot better. I also find that acupuncture sessions are a good time for me to catch up on any new problems that are happening and those routine check ins help us catch problems earlier. 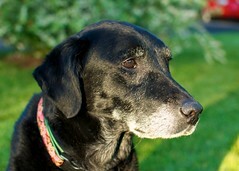 Please also see my article Acupuncture for animals with cancer – stoking the healing power within. Don’t over-supplement. Eating is the very important. The Chinese say that eating and sleeping are the two most important things to getting better. I’ve had animals come in to see me on 20 different supplements with poor appetites. No wonder, there was no more room in their stomachs for food with the sometimes 50+ pills they were getting a day. The first thing I usually do is take away most, if not all of the supplements and get them eating. Beware of any supplement over $100 a month that claims to do miracles or any supplement that claims to cure a whole list of diseases. There are many of these advertised online. Many animals come to me on they miracle supplements. I have found that even if they have good ingredients there are usually cheaper and better supplements out there. I usually pick between two (for cats) and six supplements/herbals to use in most of the animals I work with. It is not that there are not other good things out there but I want to focus on the herbals/supplements I know well and have seen work. Be careful to not over do it with western medications as well and remember that if your animal is on certain herbals or getting acupuncture you can sometimes get by with a smaller dose of western drugs like prednisone. Get help from your holistic or western vet if your animal is not eating. There are many ways to stimulate appetite in both modalities. Surgery can be helpful if there is a good prognosis (or if there is a very bad prognosis without it). This is such an individual decision with so many factors involved, it is hard make recommendations on it. However here are some general thoughts. Remember that I don’t have your animal’s case in front of me and there are some cases that will not follow these pieces of advice. I always recommend surgery for animals with osteosarcoma/bone cancer if it is in a leg and the animal can walk on three. See Maggie’s story, Sometimes three legs are better than four. This cancer is very painful and you can greatly improve their quality of life with an amputation. I find that natural treatments work well if the leg can be removed. If there are money issues I think amputation is the best place to put your money. Imagine the pain of a broken leg – now imagine feeling it all the time. Sometimes the tumor cannot be removed. In that case pain medication is very important. Splenic tumors also need to go. They are very prone to bleeding and usually will kill an animal quickly if not removed. I recommend risking this surgery in almost all cases. I usually find if we can remove the main tumor the success of treatment goes way up. If there is a primary tumor and no other detectable cancer and your animal is in good health and the surgeon thinks they can remove all or most of it, I will recommend removal. It is hard to get rid of large tumors with natural methods alone. If the cancer is in multiple places I usually recommend against surgery. It is risky and usually doesn’t help the prognosis. If your animal is very old, sick or debilitated I do not recommend surgery, as the recovery is too difficult. From my experience, cats don’t always do as well with surgery involving the abdomen or chest as dogs. Keep that in mind when making your decision. That being said I always recommend removing or debulking fibrosarcomas in cats. Chemotherapy can be very helpful in fast moving cancers. If your animal has a good prognosis for cure and can handle it I often recommend it. Lymphoma is one cancer that responds very well to chemotherapy. It is so fast moving that the natural methods usually do not have enough time to kick in. I have found the best prognosis with lymphoma to be in using a combination of chemotherapy, acupuncture and natural herbals/supplements. Look into the prognosis on the chemotherapy cure rate for your animal’s cancer. If they have a great then 50% prognosis of getting a year or more it might be worth it. If it only buys a few months, it is probably not worth it. Most animals do quite well with chemotherapy. They don’t get as sick as us. Also remember if you start chemo and it makes your animal sick you can decide to stop it. If possible do acupuncture with chemo. It can really help to support the immune system and reduce any possible side effects plus there is some evidence that it can make the chemo work better. I do not recommend chemo for the very old and debilitated or those animals who are very sensitive to drugs. Another consideration in putting an animal through chemo is that there will be some exposure to the chemo drugs through your animal’s urine. If there are pregnant women or small children in the household this can be a significant issue. If your animal has incontinence issues this can also be a problem as it can be dangerous to have urine contaminated with chemo drugs throughout your home. Find your own path and follow it. Listen to all the experts, do your own research, make your own decisions with your animal in mind. I had a client awhile back with a beautiful dog Jezebel who had a nasal carcinoma. According to western medicine she had 0% chance of remission. Her person decided to do surgery to remove as much of the tumor as possible, they could not get the whole thing. We did weekly acupuncture and a handful of herbals/supplements. The main western treatment for this cancer was radiation. The problem was that it would cause a lot of discomfort, scarring and possibly some nerve damage to her face. The recommendation was four treatments of radiation. He looked into the research on the radiation and found that there had been comparisons between not doing radiation and doing four treatments but no studies on doing less than four treatments. He also found that the main damage to the nerves and scarring came from the forth treatment. Usually the first two treatments were ok and the third cased mild discomfort. With that information he decided to do three treatments and skip the forth. (He also did a short course fairly non-toxic chemo drug). The cancer never came back. She ended up dying of old age complications. Now if he had done all four treatments most likely the cancer would not have come back either but she would have been left with permanent scarring and discomfort. He chose to follow his own judgment based on all his options and research and his dog greatly benefited. There are many options out there. Many are not written up. Do what is best for your companion. Always take your animal’s health and temperament into account. If they are very old and sick don’t push chemo and surgery. If they get extremely stressed going to the vet chemo or radiation may not be a good option especially if the prognosis is not glowing. 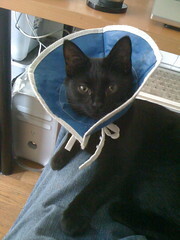 I have even had some animals who got stressed enough from coming for acupuncture that we decided it was not worth it. I have seen chemo be pushed on the very old and sick without good results. Remember even if the prognosis is good, it may not be for your animal if they can not handle the treatment. Often times these debilitated and sick animals do much better with holistic treatments then western ones.There are many herbals I can use that work very well against cancer and actually help older animals feel better at the same time that they work to kill cancer cells. Radiation can help in some cases but it is very stressful on the body because of the anesthesia. Radiation can be a good option for fibrosarcomas, osteosarcoma that cannot be amputated and some other tumors but your animal will need to be under anesthesia for every treatment. If a few treatments are all that is needed and the prognosis is good it is definitely something to consider. Usually for a good cure rate you need to surgically remove as much of the tumor as possible before radiation. Except to treat pain in osteosarcoma I usually do not recommend radiation unless the tumor can be mostly or completely surgically removed. Money does come into it. As much as we all wish it didn’t, it is the case for many of us. Cancer treatment is expensive. I’ve had many clients who have spent more than $10,000 a year to treat their animals. Do what you can. Sometimes being home with your animal and spending time with them is more important then working overtime to afford chemo. A good veterinarian will help you come up with a plan that fits your budget. Often times herbal treatments are cheaper than chemo. I have seen animals do very well on some of the cheaper herbals. Using just Sanshedan and Artemisinin in a 50lb dog costs less than $100 a month. Many times searching online can yield larger discounts on some of the cancer products and online pharmacies often have cheaper prices for western drugs. There is no right answer. The most important part of my job as a holistic vet is helping people find the right path for their beloved companion. This is often done by combining all the knowledge we have and what they know and feel about their animal. Every animal is different and that needs to be looked at. Go with your gut, seek advise from those you trust and know that there is no way to know for sure what the outcome will be when you are dealing with cancer. Most importantly remember to just appreciate every day they are here. I learned that lesson well from a dog named Rooney, who lived with cancer for three years and inspired me to start this blog. This entry was posted on Monday, March 28th, 2011 at 6:08 am	and is filed under cancer book, health. You can follow any responses to this entry through the RSS 2.0 feed. Both comments and pings are currently closed.